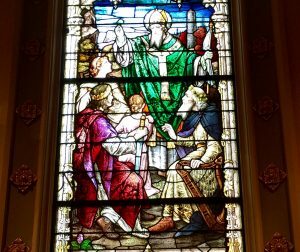 Each year around March 17, the name of St. Patrick appears in every major publication in the civilized world – sometimes with honor and sometimes with scorn – often due to the conduct of those who celebrate his memory at affairs which bear his name. Of the many things written about this holy man, some are true, some misleading, and some false. St. Patrick was Italian; St. Patrick drove the snakes from Ireland; St. Patrick was the first to bring Christianity to Ireland – all of these statements are false! Let’s take them one at a time. Some claim St. Patrick to be Italian because he was born in Roman occupied territory, and his name was Patricius. Sadly, the mists of time have clouded the exact location of his birth, but what is concluded from available evidence is that he was born somewhere in Wales around 386 AD. Patrick himself wrote that the scene of his youth was Banavem Tiburniae (possibly the town of Tiburnia near Holyhead in western Wales), where his father was a member of the governing body. Other Welsh sources suggest southern Wales near the Bristol Channel at the mouth of the Severn River. Although Wales was part of the Roman Empire at that time, it was a Celtic country and its people were one race with the people of Ireland, Scotland, Brittany, Cornwall, and the Isle of Man. As for his Italian sounding name, it was given to him when he was consecrated Bishop and assigned to the mission in Ireland. Before that time, our patron Saint’s name was Succat, a Celtic name meaning victorious. There is, therefore, more evidence to suggest that Patrick was Celtic than any other nationality. He even identified himself as such in his letter to the British prince, Corocticus. As for the snakes, although a popular legend, it is geologically known that there never were any in Ireland, to begin with. His connection with that legend stems from the Viking misinterpretation of his name. Paud in the old Norse language meant a toad, and when the Vikings heard of a Saint called Paud-rig, who had lived in Ireland before their coming, they concluded it meant toad-expeller. That was only the beginning, because the legend was reinforced by the Church’s representation of the Devil in the form of a serpent, and statues of Patrick driving the Devil out of Ireland in that form. 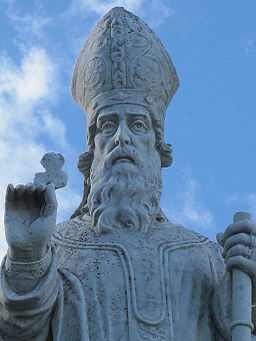 The fact that there were no snakes led to the question, “what happened to them,” and the answer was easily found in St Patrick’s traditional statue. However, Patrick is more revered for what he brought to Ireland than what he drove away. Yet he was not the first to bring Christianity . . . he was, however, the most effective. Succat received religious training at monastic settlements in Gaul, Italy, and the islands of the Tyrrhene Sea. He was ordained a Deacon by Amator, Bishop of Auxerre about 418 AD, and was consecrated Bishop – receiving the name Patricius – in 432 AD. At the time, there were a few Christians already in Ireland, but without a central authority and in such isolated areas as an island in Wexford harbor where St. Ibar had established his church and school. In any case, it is certain that Patrick was in Auxerre in 431, when St. Germanus selected Palladius, a contemporary of Patrick’s, as the first Bishop of Ireland, but that mission was short-lived. According to the memoirs of Tirechan, a cleric in Meath about 690 AD, Palladius died or left within a year. Patrick was assigned to replace him in 432. Working to his advantage was the fact that Patrick knew Irish customs and language from his years in captivity and the fact that he was a Celt. Patrick never condemned the Irish as idolatrous pagans but appealed to their pride. He explained their traditions in terms of Christianity and was eventually accepted as one of their own. He converted key people among the nobility and recruited a native clergy. He began his missionary work in Ulster, built his first Church at Saul, two miles from Downpatrick, and from there journeyed across the land. Patrick’s own writings and the writings of his contemporaries show him to have been a missionary of extraordinary zeal, energy, and courage, careless of his own safety in his fervor to `spread the nets for God’. In his own writings, he mentions this `divine impatience’ as well as describing himself as one of the Irish. For 29 years, Patrick labored among his beloved Irish, converting and baptizing them by the thousands until his death on March 17, 461 AD. Tradition establishes that he was buried at Downpatrick where he shares the same grave with Saints Bridget and Columcille who were later interred with him to protect their remains from Viking raiders. He was recognized as a saint in the 17th century by the extension of his feast day to the universal Church calendar. However, by all accounts, the most momentous part of his legacy is the form of Christianity he left in Ireland for it inspired a life of sacrifice for the sins of man. That sacrifice, which became known as ‘white martyrdom’ included prayerful solitude, fasting, tedious transcription of sacred documents, abstinence from worldly pleasures which to some meant dressing in coarse garments and sleeping on hard beds with stone pillows, and most importantly, missionary activity. It was this devotion which led to Ireland becoming the Isle of Saints and Scholars, the University of Europe and the Lamp of the West; and it was his fervor to spread the nets for God that led future generations of Irish monks to travel the continent as missionaries, bringing the light of learning back into the abyss after the Dark Ages and saving civilization. This then is the man – the Saint – that we honor in March, and it our duty to see that nothing but praise and reverence are attached to his name. We may celebrate his memory with joy, but remember his love for the Irish, the tremendous gift of faith that he bestowed upon us and the inspiration he provided which benefitted civilization, and celebrate with reverent joy. We can begin by replacing all references to Paddy’s Day with the proper name of Saint Patrick’s Day for the difference between Paddy’s Day and St. Patrick’s Day is the same as the difference between the office Christmas Party and Midnight Mass.